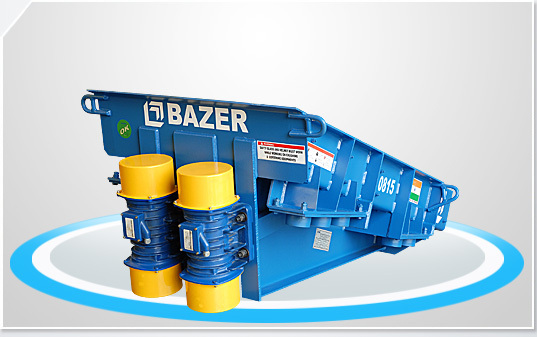 BAZER Vibrating feeders provide greater efficiency with a longer service life over a wider range of rigorous applications. The feeder design allows for maximum equipment utilization. By decreasing your overall operating costs you get a longer payback and higher return on your investment. Two unbalanced imported electromechanical motors are used to generate linear motion. Equipped with a rectangular section trough covered with static skirt. Special replaceable wear resistant liners. Best suited for the extraction of products in bulk from storage bins, hoppers, feeding conveyors etc. Excellent service life of the electromechanical motors with little maintenance. High strength steel used in feeder pan.